At our Newport factory, Acorn Glass are able to sandblast glass to any pattern or design you may require and if required a sealer coat can be applied to the sandblasted surface making it easily cleaned and marks removed. Typical products that have been successfully sandblasted/etched by Acorn Glass have been entrance screens, shower screens, glass partitions, doors and windows, mirrors balustrades. Acorn Glass have the skills and expertise to produce individual, bespoke designs using a range of methods including bevels, colour coating, sandblasting, printing, coloured films and lead overlay. Most colour scan be made or matched at our factory where it is then sprayed onto the individual glass panes that make up the decorative glass feature by our skilled spray team. 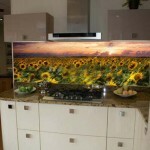 The modern initiative is to have patterns or pictures printed onto the glass to form a complete feature or part of a feature. Designers we work with have used this application to produce bespoke worktops, splashbacks, glass wall panels and glass partitions. At Acorn Glass we can arrange for this to be incorporated in your design although it should be noted that the quality of the finished printing will depend upon the quality and resolution of the medium provided. Our technical team are there to help you in your decision and will advise you prior to you making your decision. The use of coloured film, flat and textured, is used in conjunction with lead overlay and bevels to create stunning decorative glass features to your design or to match another. 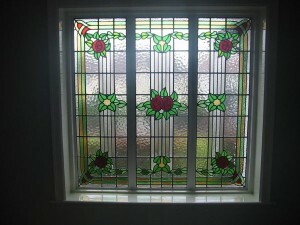 At Acorn Glass we use decorative Georgian bars where our client or designers wish to enhance the appearance of the glazed units, typically in windows and conservatories. The Georgian bars , are available in a range of colours and finishes including; white, wood grained oak, chrome and gold.